Joseph Giandonato shows a picuture of his daughter Alissa, who he lost to addiction. 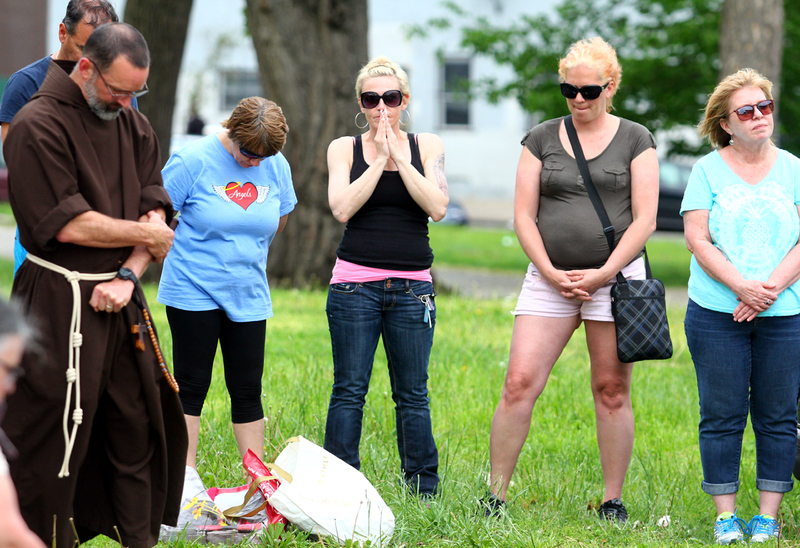 He offered prayers for her for during Mass in McPherson Square Park. 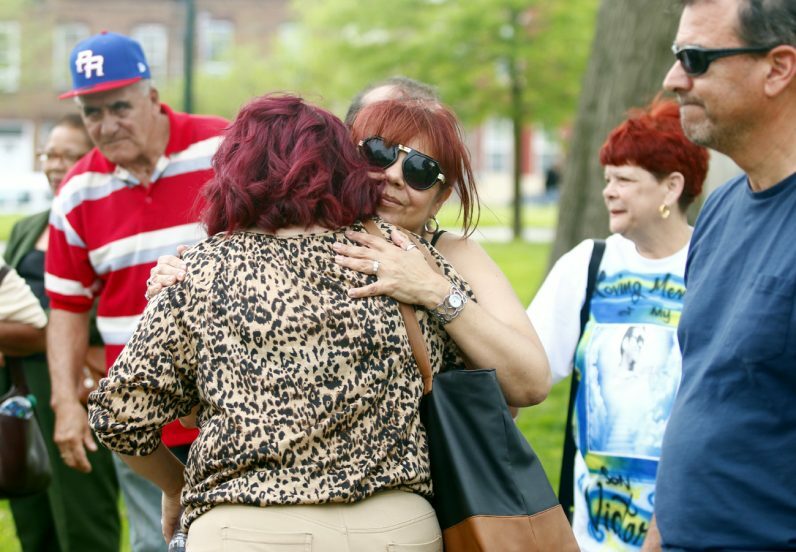 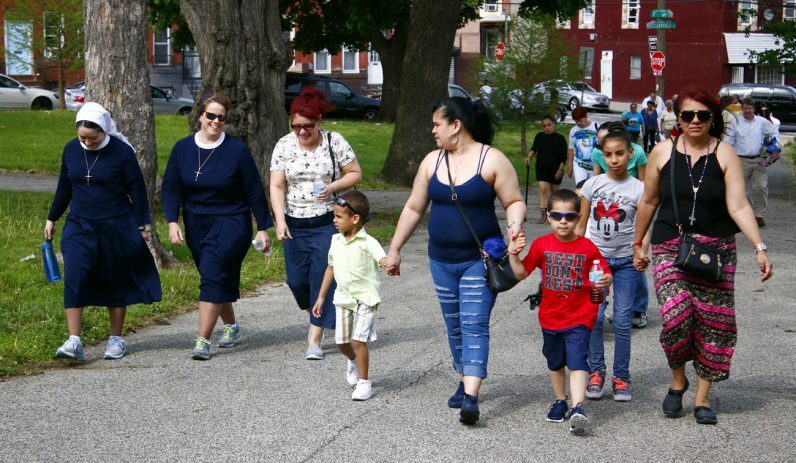 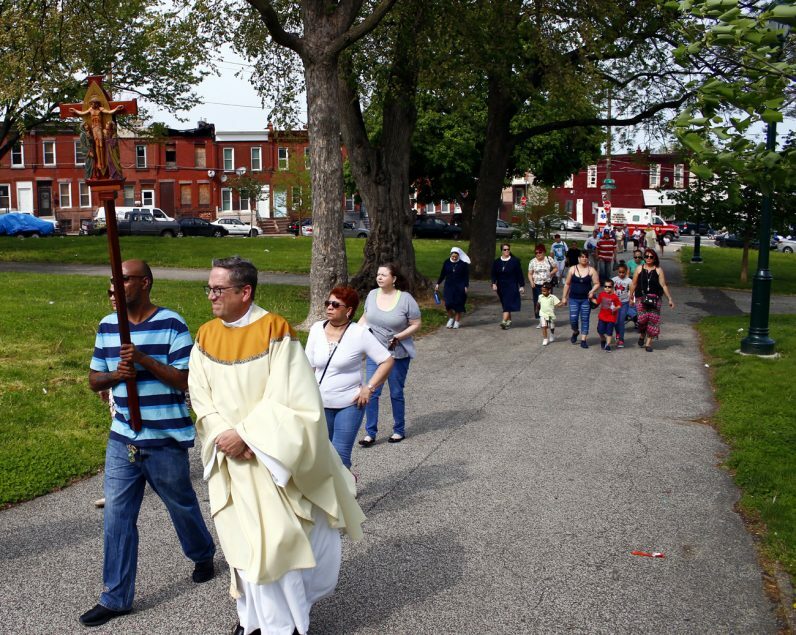 Friends of Mother of Mercy House, a Catholic outreach center in Kensington, prepare for a procession to McPherson Square Park in the neighborhood last spring, where they participated in an outdoor Mass at the park known for its visitors’ drug usage. 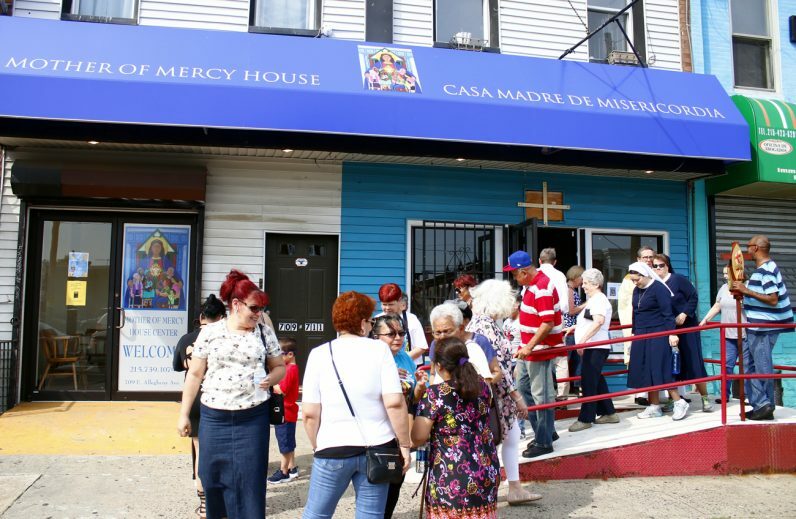 Victor Colon leads the procession from Mother of Mercy House. 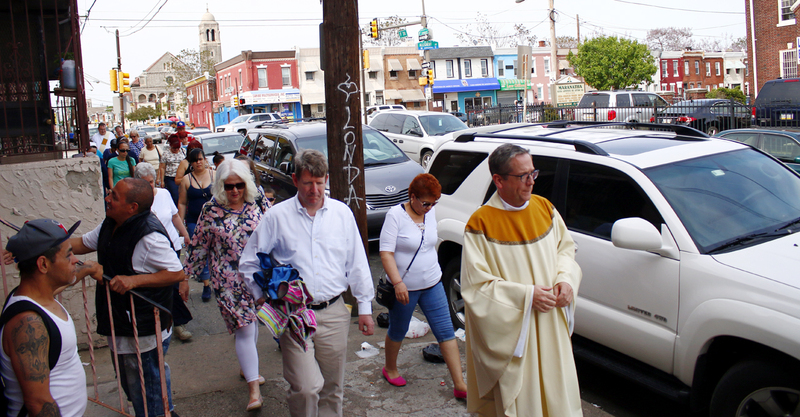 Father Liam Murphy walks with people of the community to McPherson Square Park from Mother of Mercy House, seen in the background. 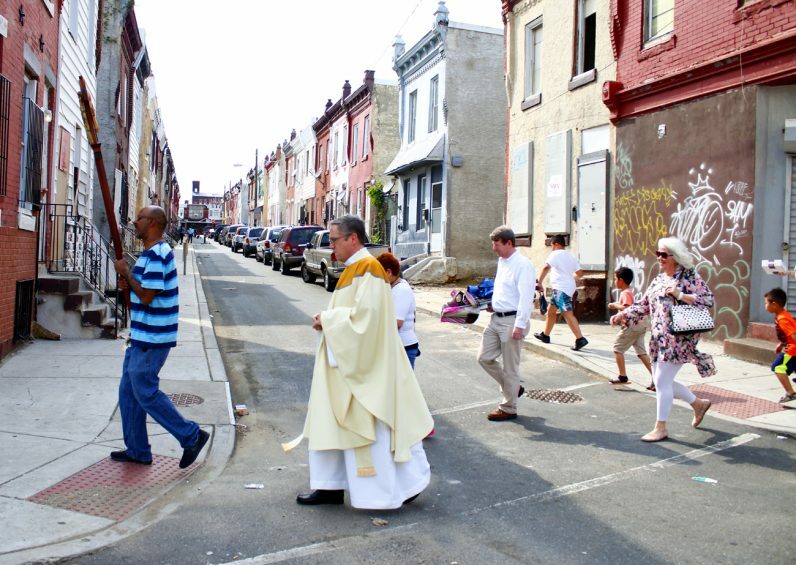 Behind it far in the background sits the looming Ascension of Our Lord Church, which as been closed and vacant for five years. 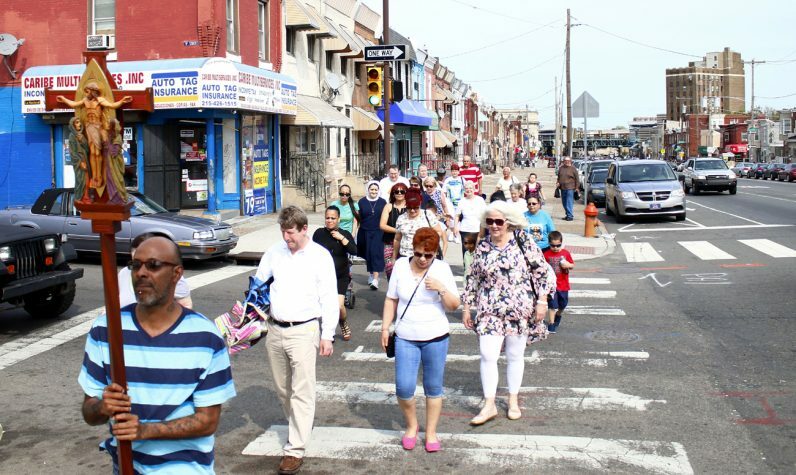 The procession winds through the streets of Kensington. 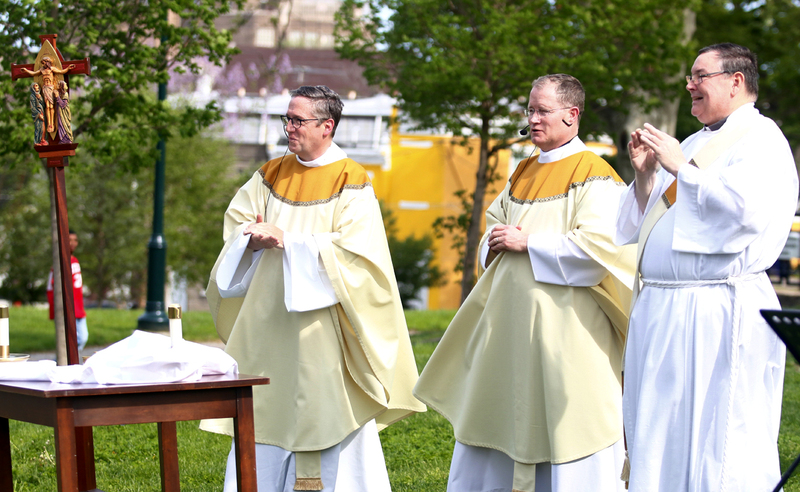 Victor Colon and Father Liam Murphy lead the procession through McPherson Square Park for Mass. 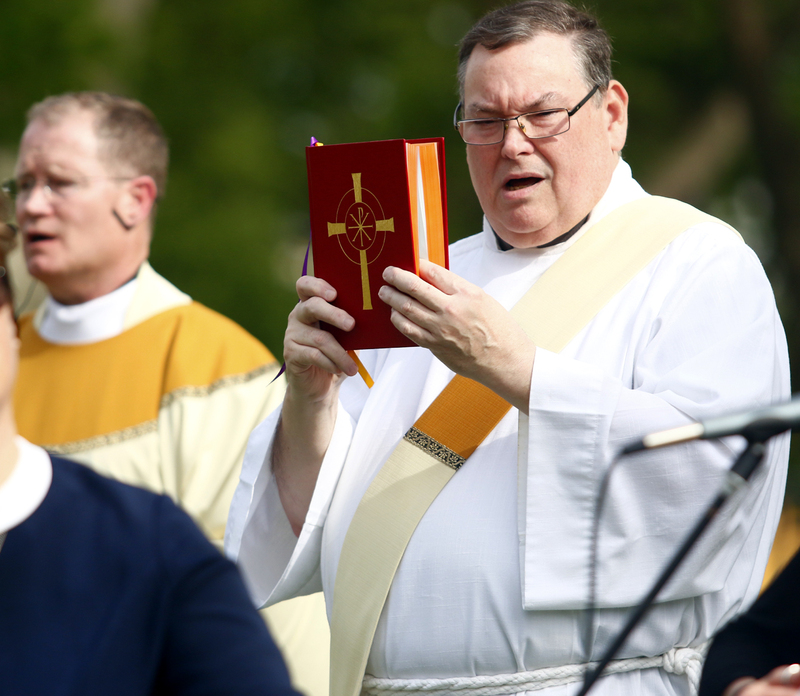 Fathers Liam Murphy and Father Joseph Devlin celebrate Mass in McPherson Square Park as Deacon Steve Guckin assists. Christopher (left) and Ethan pray with their mother Antonia during the Mass organized by Mother of Mercy House on Allegheny Avenue. 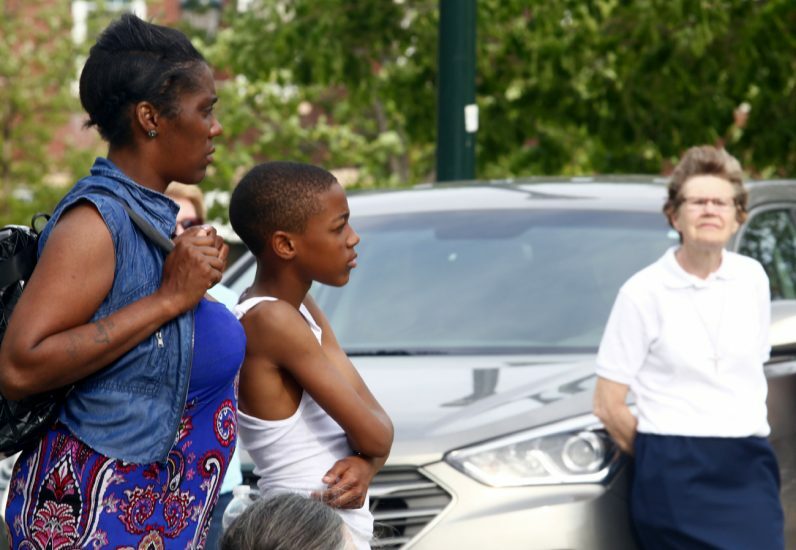 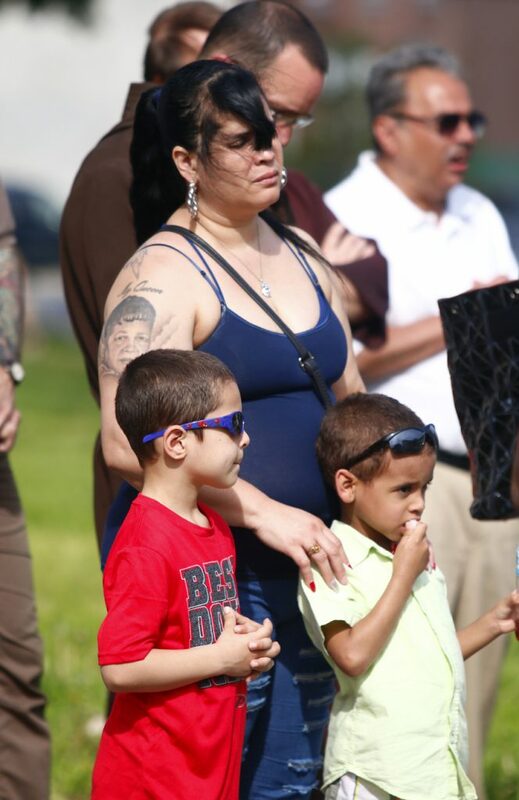 Hyneesa Benson and her son Charles Foreman attend the Mass even though they are not Catholic. 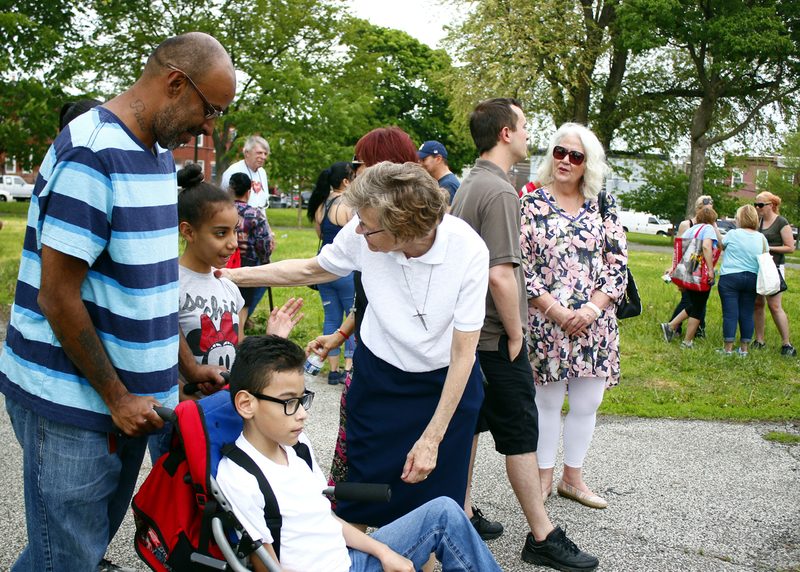 Initially coming to the park to support the community Mass, Hyneesa recognized Sister Ann Raymond Welte, I.H.M. 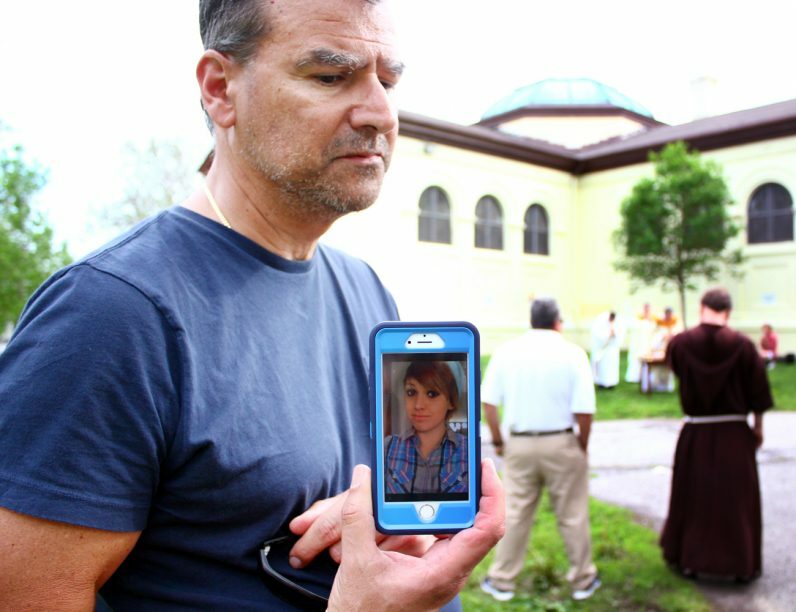 (right), from her grade school days. 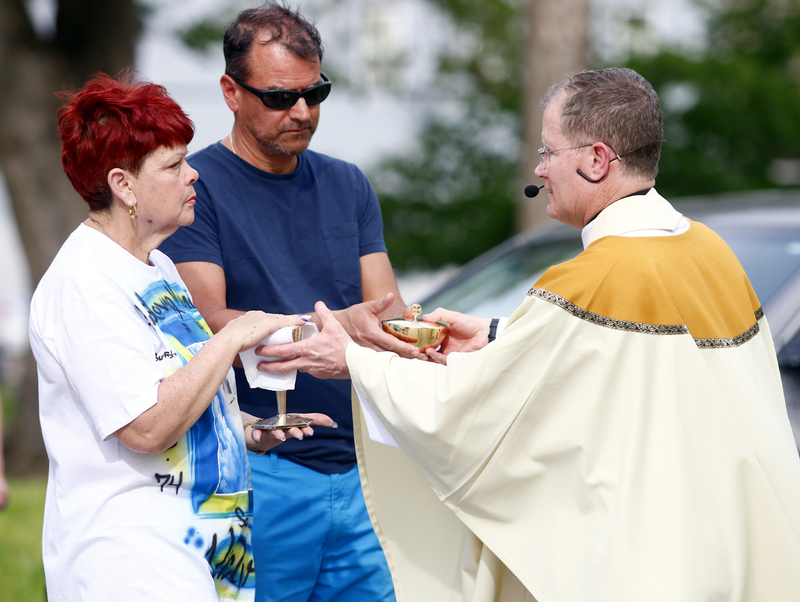 Marta Mirnda and Joseph Giandonato, who both lost their children to drug overdose deaths, bring up the offertory gifts to Father Joseph Devlin during a Mass for addictions at McPherson Square Park. 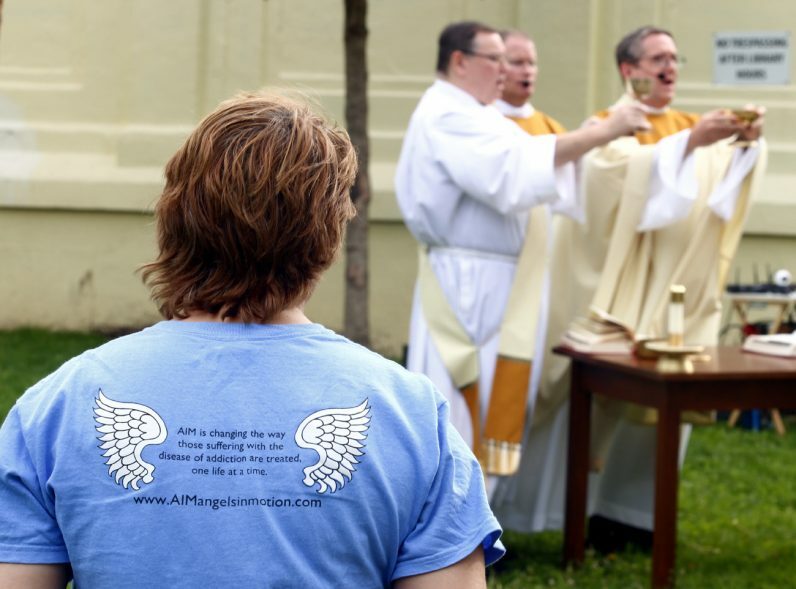 Members of Angels in Motion (www.AIMangelsinmotion.com), an organization that serves those who suffer from addiction particularly in the area where Mother of Mercy House serves, attended Mass in memory of those lost to drugs and in continued prayer for those who are still suffering. Sonya Colon offers a friendly sign of peace. 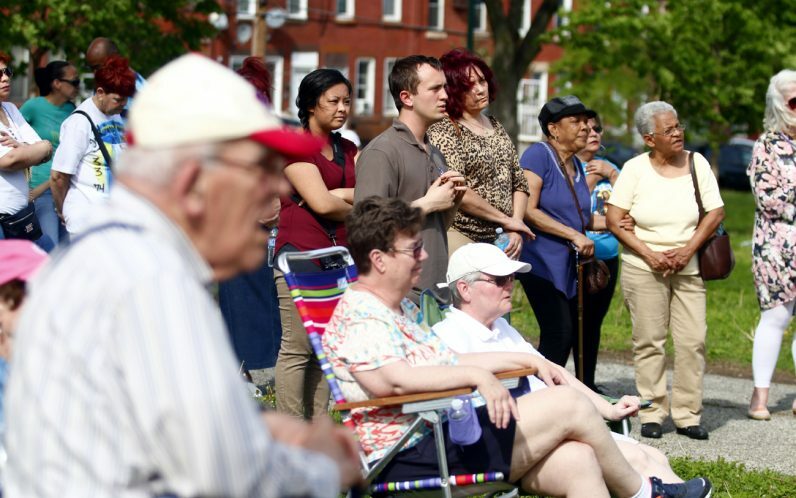 Sister Ann Raymond Welte, I.H.M., chats with those who attended Mass at McPherson Square Park. 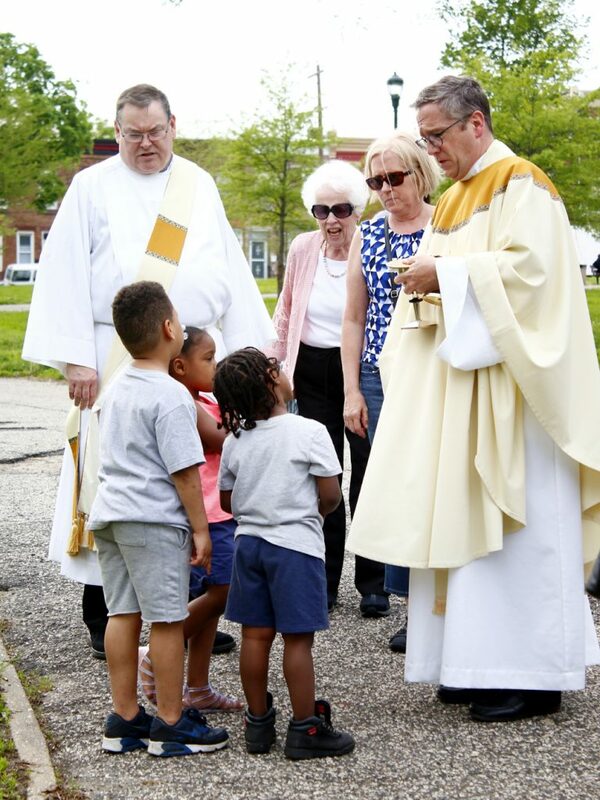 Deacon Steve Guckin (left) and Father Liam Murphy chat with young children that came over from the playground to ask what was happening in the park. 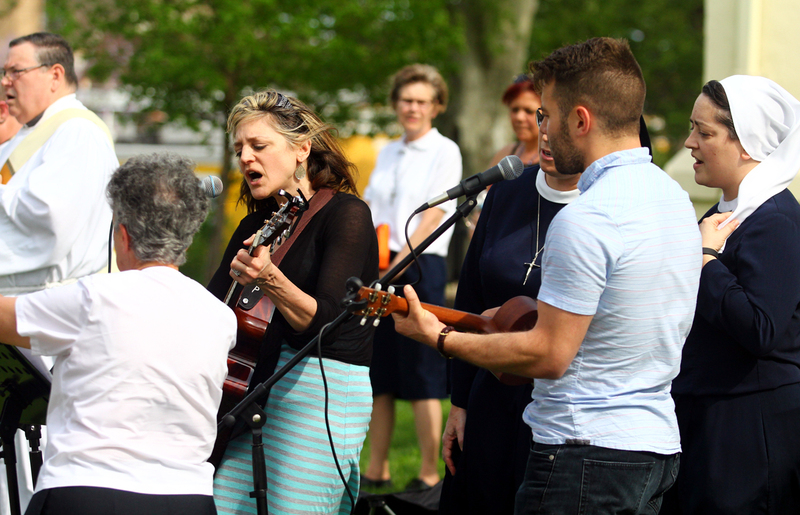 Musicians lead a hymn of praise during Mass on a windy Saturday afternoon in the park. The faithful of Mother of Mercy House and community residents celebrate Mass for all those touched by addiction. 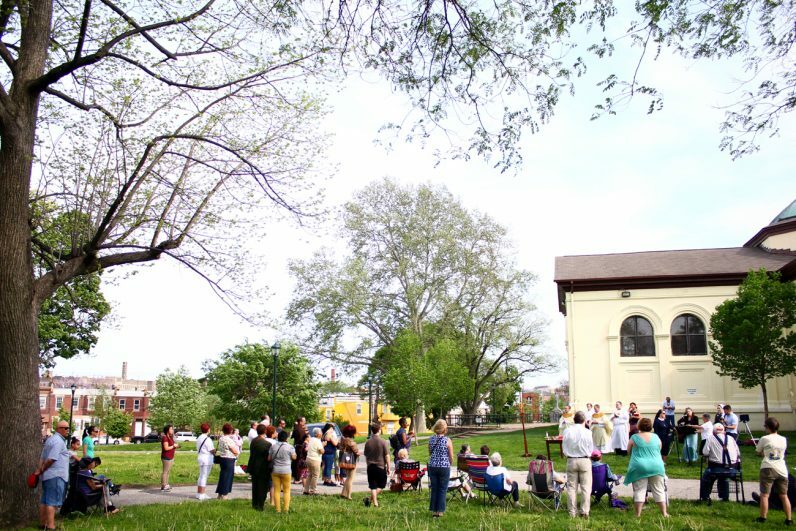 The location for the Mass was significant as McPherson Square Park is commonly known as “needle park” for its reputation as a place for drug use.